In this tutorial you'll learn how to use multiple forms, how to handle user input and how to use sessions. 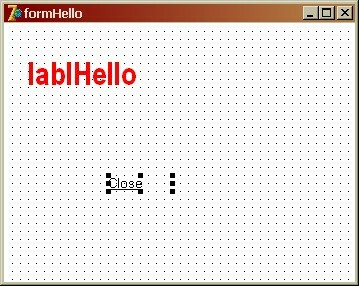 In order to understand and run the example in this tutorial you should read the "Hello World" tutorial first. 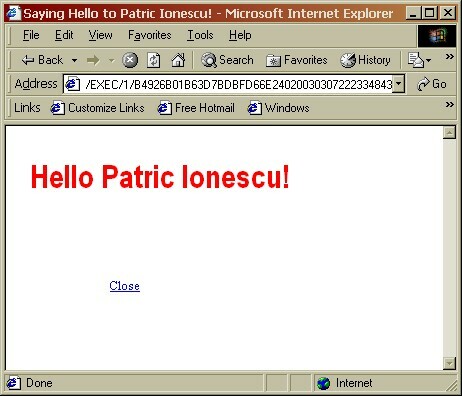 This application is built using IntraWeb's application mode. The last tutorial was very basic and designed to simply show you how easy it is to get an IntraWeb application up and running. As you will soon see the code used is still standard Delphi code. We challenge you to try even something this simple with any other web development tool. Other development tools require you to set up adaptors, bindings, or handle the HTTP variables your self. Not IntraWeb, IntraWeb is truly componentized. For this demo, we will continue by modifiying our "Hello World" application built in the Hello World demo. If you have not created this project yet, you will need it for this demo. 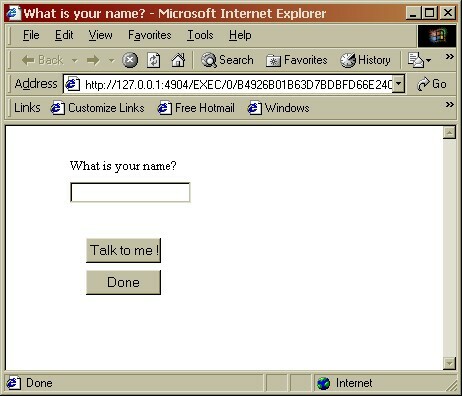 · Set the form's Title property to "What is your name?". This will be displayed as the page title when shown in the browser. 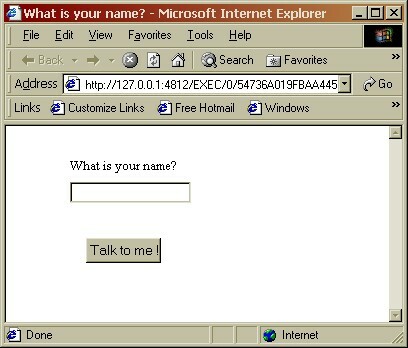 · Change the label's Caption to read "What is your name?" · Add a TIWEdit to the form. 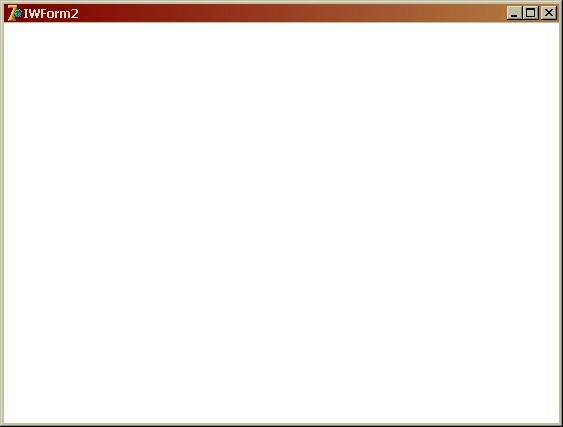 · Set the Text property to be blank. · Set the Name property to editName. 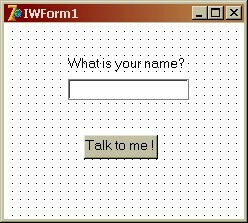 · Add a TIWButton to the form. · Set the Caption property to "Talk to me!". If you have never worked with web development tools before, this next step will not seem like magic for you as you will think, "This is the way it should work, no?". However if you have worked with other web development tools, you will now really begin to see where IntraWeb is different. Notice the browser has picked up on the page title as set in the form's title property. Please see "Why when debugging using the IDE and Netscape 4 is the application is slow on the development machine and the task manager shows 100%?" in the FAQ. 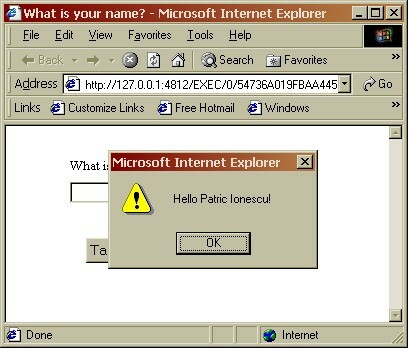 Please see "When when using Internet Explorer is there a delay when I first click on a button?" in the FAQ. Please see "Why did the chicken cross the road?" in the FAQ. // To handle the button click all we did was define an OnClick! End of story! WOW! // Read the users entered text from the Text property. // No parsing of HTTP variables, no adaptors, no bindings. // JUST like Delphi! Wow again! // See if the user entered anything, or if they left it blank! // Show a message dialog. Could it be any simpler? // Clear the edit box. The properties are not only for reading, but writing too! ust to show you that there are no hidden gotchas with IntraWeb, let's continue on and show you how easy it is to do multiple forms with IntraWeb. 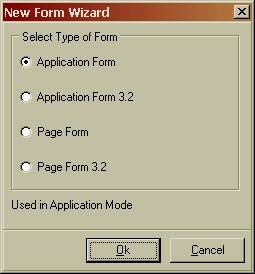 This dialog allows you to select whether you want a Page Mode form, or an Application Mode form. For each of those, the HTML type is also selectable, so you can chose to produce a HTML 3.2 form or a HTML 4.0 form. For this tutorial we'll chose "Application Form", which will produce a HTML 4.0 application mode form. For a detailed explanation of page mode and application mode, please refer to the IntraWeb Manual. · Change the form Name property to formHello. · Set the Name property to lablHello. · AutoSize = False. We will be adjusting the text at run time and thus will be manually adjusting the width. · Set the Caption property to Close. · Create an OnClick event by double clicking on the TIWLink. ServerController, IWBaseForm, unit2; //Note - if you changed your second form's filename - change this! // represents the user's session. 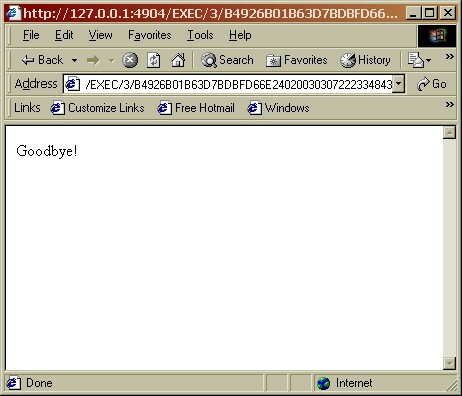 // Terminate the user's application and display a message. If you are a Delphi shop, there is no doubt your programmers can be up and running with IntraWeb in a matter of minutes while continuing to use their existing skills. You can develop web applications in days instead of months, and you can take on web projects previously deemed impossible or too time consuming. Now, can you honestly say that about any other web development tool? This tutorial took the next step and demonstrated the ease of handling user input and managing multiple forms.However IntraWeb is far more powerful and has many more features than what has been demonstrated here. To see the full power of IntraWeb you need to look at the included demos and better yet, write your own application. The evaluation version is fully functional, so what are you waiting for?